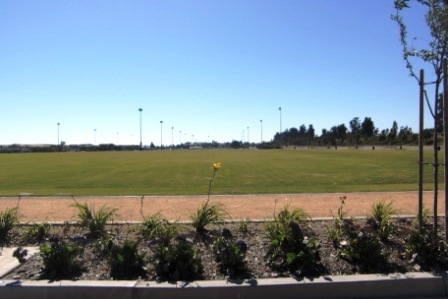 Pleasant Valley Fields, located at 100 Village at the Park Drive in Camarillo off the Dawson 101 exit is an expansive, flat 55 acre park, with 23 acres of grass fields, including 10 full-size soccer and softball fields. There are 3 restrooms, a small playground area geared towards 5 to 13 year olds and nearly 600 parking spots. The park opened in Spring 2010. View of Pleasant Valley Fields looking from east to west.